1. If I make tomorrow’s list before I go to bed, I sleep better. I have a plan for the day and I know exactly what I need to do as soon as I get up. Plus I’m not trying to remember what I have to do tomorrow because I already planned it out and wrote it down. 2. 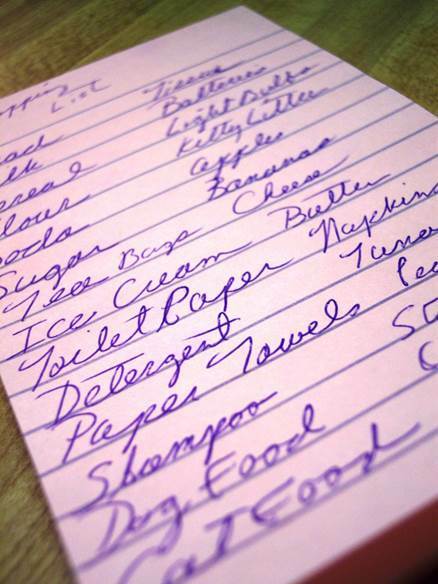 When I’m making the list the night before, it gives me more time if I discover something that needs done beforehand, like making sure certain clothes are clean, having cash on hand or taking food for the office potluck. 3. If I wait until the next morning to make my list, I lose a lot of time in the morning trying to decide what to do. By the time I get up, get dressed and figure out what I want to do, the day is already well underway and I feel behind. 4. When I plan, I always plan what we’re having for dinner. Planning the night before gives me time to thaw anything I might need for the meal. 5. Knowing what I’m doing tomorrow helps me prepare mentally, especially if it’s going to be a tough day. 6. Making my list the night before helps me know what time I need to get up. If I have a lot going on, sometimes I need to get up a little earlier. If it’s going to be a slower day, I can take my time in the morning. But I only know that if I know what’s going on. 7. When I make my list the night before, I notice if there are any conflicts or if there’s too much to do. That allows me to make adjustments before the day gets started. 8. If there’s something I need to do first thing in the morning, I might miss it or be late if I wait to make my list until morning. When do you make your to-do list?